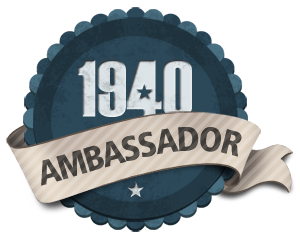 I'm An Ambassador - Are You? Matrimonial Monday - Beane & Henry Are Hitched! The 1940 Census - "I'm In It"
Sympathy Saturday - Henry C. Dreher, Jr.
Treasure Chest Thursday - What A Diaper Pin! Parchment documents relating to Galileo's heresy trial, the execution of Mary Queen of Scots and Henry VIII's divorce will go on display today in an unprecedented exhibition of 100 documents from the Vatican Secret Archives. Read more at The Telegraph here. Wordles Wednesday - More of Those Wedding Day Pics! 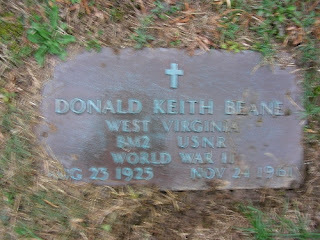 Donald Keith Beane was born to Golden Servetis Beane and Corda Pearl Thomas. He was one of six children born to the couple. 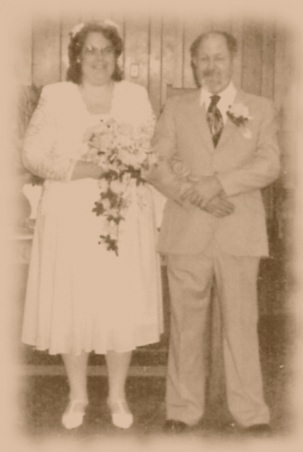 On 21 Jan 1949 he married Doris Lee Sisson in Sissoville. The couple had two children together. Don was a member of the US Navy Reserves in WWII. He is buried at the John Beane Cemetery in Sissonville, Kanawha County, West Virginia. I signed up last night to help to index the 1940 Census! Although I'm not in it, my parents and grandparents are! I've started with doing a few marriage licenses [indexing for Kentucky]. And my preference is for an intermediate difficulty. That means there some real "hum-dinger" handwriting going on! But you can choose to simply index those records with a better handwriting, which helps if you have difficulty interpreting some pretty sloppy writing! Have you signed up yet? If not, head on over to the project site and sign up! You can sign on here. 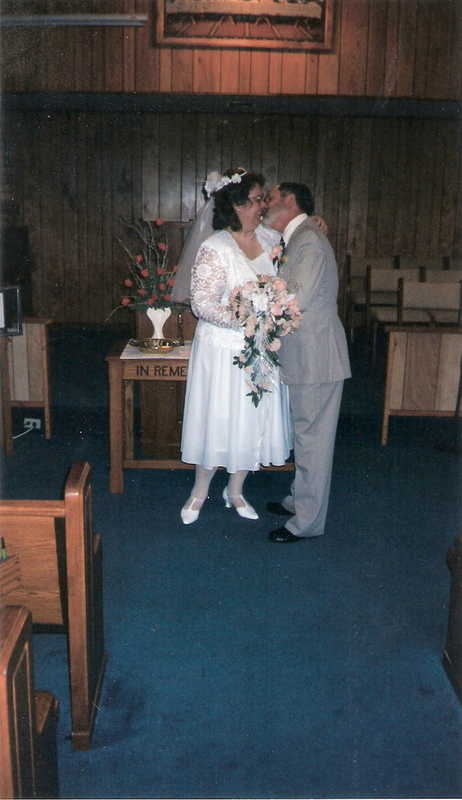 Two old farts, finding love the second time around! I am sure I am not alone when I say I collect the photographs of my family. I have, literally, thousands. And, of course, along the way, there have been those photographs which were unidentifiable. Oh, they came from numerous sources. They were, perhaps, found in a box of grandmother's old photographs; or Uncle's tobacco box after he passed away; or tucked in some distant cousins Bible. I cannot bear to part with any of them, thinking that perhaps one day I will find the identity of these individuals. And so, for the next few weeks, I will be posting some of this collection on Sentimental Sunday's. I can't think of a more appropriate title! 1. Cynthia Ann BEANE was born in New Albany, Floyd Co., IN. She was the daughter of 2. Walter Maxwell BEANE and 3. Lois Velleda DREHER. She married Johnnie Lee HENRY in Covington, Alleghany Co., VA, son of Joseph Wright HENRY and Betty Louise Rotge. He was born in San Antonio, Bexar Co, TX. 2. Walter M. BEANE was born in Waiteville, Monroe County, WV. He was the son of 4. John Monroe BEAN and 5. Mary Elizabeth FAUDREE. He married Lois Velleda DREHER in Presidio of San Francisco, San Francisco, CA. 3. 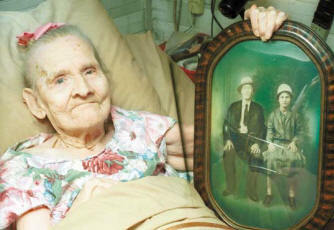 Lois Velleda DREHER was born in Georgetown, FLoyd Co., IN. She was the daughter of 6. Henry Condar DREHER Jr. and 7. Irene Caroline BANET. Children of Walter and Lois: Cynthia Ann, Velleda Kaye, David Lawrence, Jeffrey Scott. PERKINS. 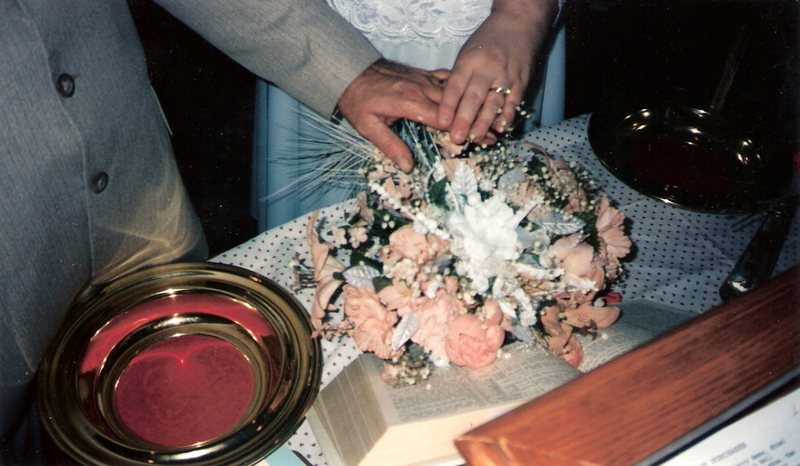 He married Mary Elizabeth FAUDREE on 01 Dec 1935 in Allegheny County, Virginia. 1975 in Clifton Forge, Allegheny, Virginia. She was the daughter of Stephen Ledford FAUDREE and Elizabeth CARNEFIX. Children of John and Mary were: Walter Maxwell, Edsel Ford and Roy Edwin. 8. William McHarvey BEAN was born on 26 Aug 1832 in Dropping Lick, Near Zenith, Monroe Co, VA.
1891 in Monroe County, West Virginia. She was the daughter of 18. Samuel PERKINS and 19.
i. 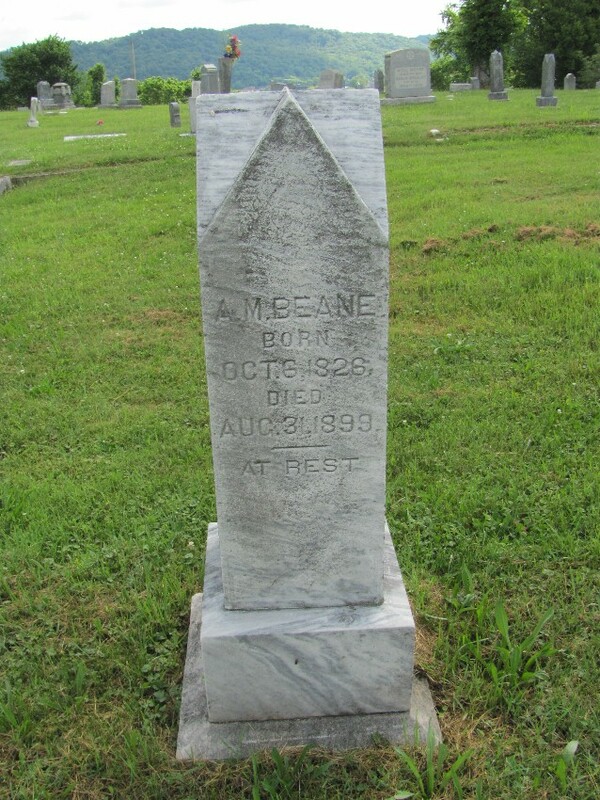 Infant BEAN was born 06 Jun 1853 in Monroe County, Virginia, died 06 Jun 1853. 1857 in Waiteville, Monroe, Virginia. 01 Jun 1879 in Monroe County, West Virginia. Waiteville, Monroe County, West Virginia. Nov 1893 in Waiteville, Monroe, West Virginia. 33. Sarah BANE. He married Rachel WISEMAN on 20 Nov 1813 in Monroe County, VA.
1833 in Monroe County, VA.
1856 in Potts Creek, Monroe Co, VA.
CARNEY 12 Oct 1868 in Kanawha County, West Virginia. Burnsville, West Virginia, married Wilson KESINGER 16 Nov 1840 in Monroe County, VA.
died 26 Jun 1890 in Sissonville, Kanawha County, West Virginia, married Mary A.
SUMMERS 23 Oct 1849 in Winfield, Putnam County, Virginia. 1899, married Anna D. DUDLEY 17 Oct 1860 in Monroe County, Virginia. PERKINS 26 Aug 1852 in Monroe County, Virginia. Virginia; married Thomas B. STEELE 06 Dec 1853. 1813 in Monroe County, VA.
***There may have been a third son, Roy, who is unaccounted for in records. 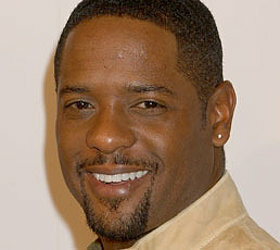 Actor, Golden Globe Nominee, Director Blair Underwood has roots that run deep in Virginia. And tonight he comes face to face with those roots, and his African heritage. Throughout Blair's twenty-five year career, his performances have been highlighted by his African-American image. He lives in Los Angeles with his wife, Desiree DeCosta and their children. Blair has a strong pride in the heritage given him by his father, a 27-year Army veteran, who retired as a Colonel; and his grandfather, Ernest Underwood, Sr. who was a police officer. "I'd love to find out the Underwood lineage, but I want to know about the maternal line as well," Underwood states. So he started at his parents house in Petersburg, Virginia. Blair's brother and mother could shed some light on his ancestry for him. His maternal grandmother was Bessie, and her mother, Ada died when she was only 8-years old. His grandfather, Harry Royal grew up in Lynchburg, Virginia. Blair's brother tells him, "Very few records are found for the African-American once you get to the Civil War, so once you hit that 150 year mark, the records are gone. They disappear." Blair has performed a DNA test [I was never sure whether he did the test, or if he had his father to do it], and they would have to wait for those results for his patrilineal ancestry markers. Blair's maternal great grandfather, Harry Royal and his great grandmother, Ada Belle White were the starting point. So he was off to the Library of Virginia in Richmond. Here he met with genealogist Joseph Shumway. Shumway found a marriage record located in Lynchburg for his great-grandparents which showed their parents as Ben and Fanny Royal and Thomas and Annie White. Next he found a marriage record for Ben Royal and Fanny Early. Fanny's parents were listed asd Maria and Sauney Early. Shumway locates Sauney Early in the 1900 Census as an inpatient in the Central State Hospital, which was a mental institution. This was an all black institution established just after the Civil War ended. Attempting to determine what had caused Sauney to be a patient in the mental hospital, they located Sauney in the 1880 Census, where he is a farm laborer, and in the 1870 Census where he is listed as a blacksmith. He is not located in the 1860 Census, and it is presumed he was a slave. And here they hit the proverbial "Wall" on Sauney. So, Shumway and Blair determine to locate what caused such a significant decline in Sauney's mental capacity over the 30-year period noted, that he would go from being a blacksmith, to a patient in a mental hospital. So, Underwood is now off to Lynchburg and the Jones Memorial Library where he meets with historian Dan Fountain. In newspaper microfilm reels they locate on 12 Jan 1876 an article titled, "Sawney Early in Limbo". The article tells the account of Sauney Early stealing a cow, skinning it, and "salting" the beef, from a Mr. Chambers. Chambers went after Early, and shot at him. The load of shot hitting Early in the face. The account mocks Early as proclaiming himself the "Second Jesus" . In another article, dated 23 Jan 1884, a man named Tardy shoots Early twice over cutting timber in Campbell County where both parties lived. The Campbell County Magistrate dismissed the case, and local blacks threaten violence over the event. Fountain states he sees Early as a conjurer . This was someone who according to African culture, negotiated the boundaries between the Spirit world and that of the living. They often wore ostentatious clothing, and Early was described as wearing such in the first article that he and Underwood read. Later, a record written as a testimony regarding Early was written by a Mr. Moore who stated that Sauney killed Chambers cow because Chambers cow kept wandering into his corn patch and eating his corn. It seemed from this that the conclusion could be reached that Sauney Early's neighbor's, when not able to force, or shoot, him to give up his property and his rights to such, found it easier when he became an old man to simply have him committed to the state mental hospital. Blair stated that Sauney was "...a man that could not be broken." "I find great solace in that," he stated. And now they went on to the White's. Ada's parents were Thomas and Harriet White. Shumway located Ada White's mother's death certificate. It listed her father as Delaware Scott . So they visited Ancestry.com and located the Campbell County 1860 Census. There they found Delaware Scott listed as a mulatto. He was a "Cooper" by trade [barrel maker], and had personal property valued at $800. There was also a woman listed in the household named Judith and was 67 years of age. This was possibly his mother. So, Underwood headed back to the Library of Virginia in Richmond. Here he met with historian Eva Sheppard Wolfe. She found in 1849 that Delaware Scott was listed as the son of Judith and he was born free in 1823 [his mother also was born free]. 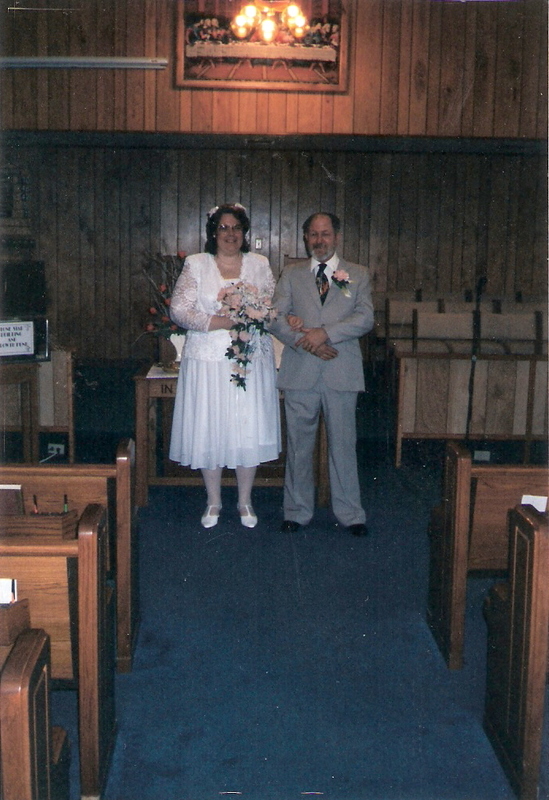 Judith had married Samuel Scott . Samuel and his mother, Amy, had been born free, in Lynchburg. So, back to Lynchburg Underwood went. To the Court Street Baptist Church, which was the first Black Church in the area. Records were found in the church where Samuel Scott had bought land. He had purchased 200 acres. Tax records also showed this purchase. Samuel Scott is shown in the 1850 Census as owning 2 slaves. In the 1840 Census he had 1 male slave 55-100 years of age. Wolfe explains to Underwood that statistically most free blacks bought family members. So it was very possible that these 2 slaves were his parents. Underwood stated, "It's empowering to know Samuel Scott took care of his parents, he took care of his own." And the Scott trail ends here. But on to Underwood's Dad's line, and the DNA results are in. Blair met with Dr. Ken Chahine, who explains that the test showed that Underwood's lineage was 74% African, as expected, and 26% European, which is usual for most people of African descent. The greatest amounts shown from France, Switzerland and Germany. Underwood was pleasantly surprised because he states he has always had an affinity and love for all things from France. He got engaged to his wife in Paris, and even named his daughter, Paris. Chahine goes on to tell Underwood that they have located a "cousin", and that they share a common ancestor from about 1690 to 1700. The match is with Eric Sonjowoh, from Babungoo, Cameroon. And so it was on to Africa with his father. On seeing the people to meet them in Babungoo, Underwood stated, "Staggering, that's how this is, staggering!" Blair and his father met Eric and his father. "You make that connection for us," Underwood stated. Eric stated that he had taken the DNA test in 2005, and didn't think there would ever be a match. Blair gave Eric a photograph of all of the Underwood family in the US, and invited his Babungoo family to come and visit them. "I will share with my children", stated Blair, all these values and of "the family coming full circle." "I am African, not because I was born in Africa; but because Africa is born in us." A profound statement. A profound feeling. This was one of those WDYTYA episodes that I can enjoy again, and again! Be watching next Friday when singer/actress Reba McIntire discovers her family roots! 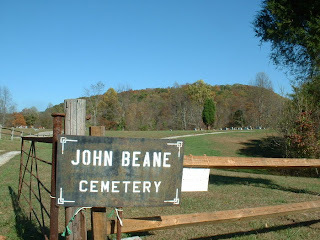 John Bean was born August 1790 and died September 1872. Although his death record, which used a friend for informant, [O. Bobbett] does not give his parents names, nor his birth date, it does list his age as 73, which is incorrect. We know by the below transcribed document, that he was actually born in 1790. What follows is a transcript for a 13-year-old boy's indenture. We know of at least one other brother, and possibly two, that were indentured around this time. We believe that John's father was named William Bean [and may have been shortened from McBean], and his mother was named Sarah. It is believed that William [Mc]Bean died shortly before John's indenture, and his mother, unable to care for her children, placed them for indenture. 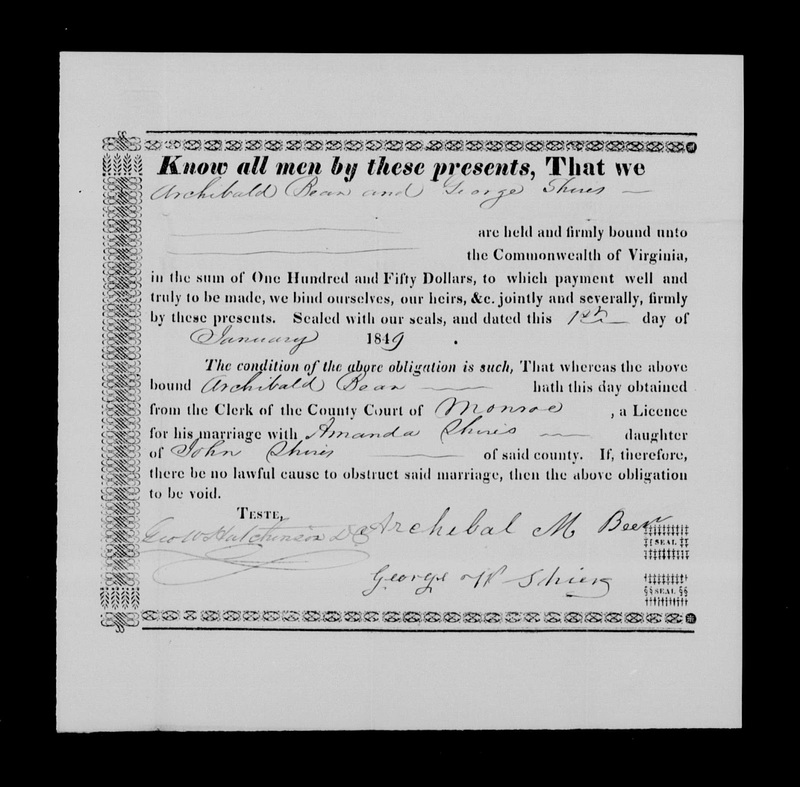 In 1805 Sarah Bean appears on the Monroe County [West] Virginia Tax Rolls as owning "only her spinning wheel and her clothes", and owing "nothing atall". This Indenture made this 20th of February one thousand eight hundred and four Between James Christy Robert Johnson Henry McDaniel and Owen Neel of the one part over seers of the poor for Monroe County and John Neel of the other part witnesseth that the S'd overseers doth bind an orphan boy named John Bean aged thirteen years and six months to the S'd John Neel county aforesaid and State of Virginia to serve the S'd John Neel Until he arrives at the age of twenty-one years Dureing all which time the S'd John Bean Shall faithrully Serve his Master and all his lawful Commands obey he shall not Suffer any damage to be done to his S'd Masters goods without giving him notice thereof He shall not frequent Still houses or taverns he Shall not play at Cards Dice or any unlawful game or at any time abscond himself from his Masters business without his Masters leave he Shall not commit fornication nor contract matrimony during Said term; But as a true and faithful Servant Shall agree to have the S'd John Bean taught the art trade or mystery of a weaver and provide for him a sufficiency of everything that is requiset for an apprentice During the term of his apprenticeship likewise he is to have him taught to read the Holy Scriptures plainly to write a plain hand and arithmetic through the rule of three which Education he is to thoroughly acquainted with at the expieration of his time and also to give Such freedom dues as the law directs taking care to have Said apprentice Instructed in the principles and Duties of the Christian religion as far as Said Master is Capable In witnef whereof the partys have Interchangeable Set their hands and Seals the day and year above writen. ...Archie had purchased it for me during his last visit to Italy. Sadly, my godparents died, just a few years apart, both barely into their sixties. So... this is a gift which I cherish. The cameo is made from alabaster, and real ivory. The chain broke a few years ago, and I tried to have it repaired, but the jeweler told me I would be better off purchasing a new chain. I've simply not had the heart since my godparent's deaths to do so. But... every now and then... 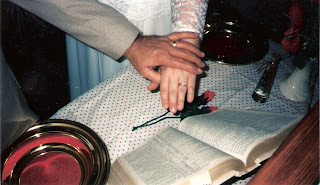 I pull it out of my jewelry box, and remember... what precious, precious people they were, and still are, to me. Archibald Marmaduke Bean[e] was born on 06 October 1826. He was the 9th [out of 13] child born to William M. Bean [1792-1864] and Rachel Wiseman Bean [1790-1856]. He was born along Dropping Lick, just south of Union, in Monroe County, [West] Virginia. Married twice, his first marriage was to Amanda Shires [1826-1850]on 01 January 1849. Amanda was the daughter of John Shires. 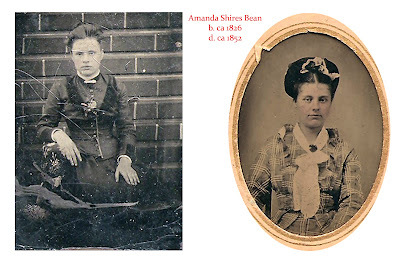 After Amanda Shires Bean's death, Archibald then married Margaret Ann Dunbar [1832 - 1904] on 08 Dec 1853 in Monroe County. Archibald and Amanda had nine children: Mary Virginia, Madorah "Dora" Wacoma, Alonzo F., Wellington Goheen, Augustus "Gus" Floyd, Laura "Belle" Arabella, Christine "Addy" Adaline, Charles Allen, and Bertha. "Arch" migrated from Monroe Co, to Kanawha Co, around 1855 when he purchased 254 acres of land in Poca District. He resided here until 1869 when he purchased 148 acres on Tackett's Creek at Coals Mouth. In 1870 he purchased another 100 acres in the same area. In 1873 Archibald sold his 254 acres in Poca District to his brother, John Jackson Bean. Archibald ran a store and lived on a houseboat located just below the St. Albans Westside bridge. Then moved to a small house just up the bank from the houseboat, where Belle Beane, was born in 1865. It is possible that Archibald and his family were in St. Albans before he bought the land in 1869. Most of the land on Tackett's Creek apparently was divided or sold to the children as most of them seem to have lived on the Creek at sometime or another. Arch died on 31 Aug 1899 in Kanawha County, West Virginia. Arch is buried at Teays Hill Cemetery, located in Saint Albans, Kanawha County, West Virginia. His first wife, Amanda, was buried in the Bean Cemetery, located on Potts Creek, near present day Waiteville, in Monroe County. 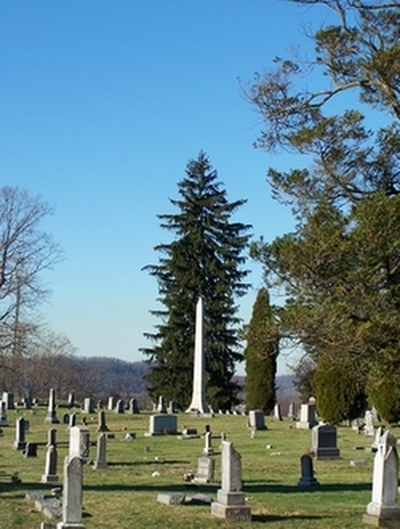 His second wife, Margaret, is also buried at Teays Hill Cemetery. The signatures for both Archibald Bean and George Shires appear to have been written by the same individual. And since both names have been mis-spelled, I feel it is safe to assume that neither of the two men wrote the signatures. [I have examples elewhere of the pairs signatures, and it is plain that both men knew how to spell and write their own names. Both were lieterate and intellectual. So, it remains unknown as to why neither applied their own signatures. Another mystery in this journey of uncovering our family history! 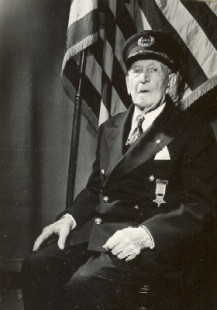 My paternal Grandfather was John Monroe Bean and he was born in 1866. So my roulette number is 18.66 or 19. #19 in my ahnentafel is none other than Elizabeth Tuckwiller, my gr-gr-gr-grandmother. 1] Elizabeth was the daughter of John Tuckwiller and Catherine Riffe and was born in Greenbrier County, [West] Virginia on 08 Nov 1779. 2] Elizabeth was the mother of nine children [my gr-gr-grandmother among them!]. 3] Elizabeth was the wife of a minister, and often entertained well-known ministers of the time in her home. Johnnie Lee HENRY was born in San Antonio, Bexar Co, TX. He was the son of 2.
was born in New Albany, Floyd Co., IN. PETTIE. He married Betty Louise Rotge on 30 Jul 1947. John Cornelius ROTGE was born on 16 Jan 1910. He died on 09 Jun 1983 in Kerrville, Kerr, Texas. He was the son of 12. Peter ROTGE and 13. Lillie Mae Surber. He married Ora Lee Sparks in 1930. Lillie Mae Surber on 15 Nov 1902.
was the daughter of 54. Alexander Campbell SURBER and 55. Emeline WEEKS. Viletha McCLURE. He married Emeline WEEKS. Emeline WEEKS was born 30 Oct 1828 in Pulaski County, Kentucky. She was the daughter of 110. WATKINS. He married Louisa Viletha McCLURE in 1827 in Washington County, Virginia. Texas. She was the daughter of 218. William McCLURE and 219. Mary SHIELDS. Jacob Campbell SURBER was born in 1784 in Washington County, Virginia. He died 09 Mar 1844. He was the son of 432. Adam SURBER and 433. Margaret Unknown. He married Mary WATKINS. 1853 in Kentucky. She was the daughter of George WATKINS and Ann REED. 432. Adam SURBER was born 1751 i Germantown, Pennsylvania. He died 10 Apr 1833 in Kentucky. He married Margaret UNKNOWN. He was the son of Henry SURBER. Margaret UNKNOWN was born 1780 in Culpeper, Virginia. She died Oct 1822 in Virginia. 464. Henry SURBER was born 1710-1718 in Kanton, Aaignon, Switzerland. He died 28 Sep 1754 in FrederickCounty, Virginia. Using a rare and unbroken document trail, scholars have succeeded in tracing a 10-year old girl from her kidnap in Sierra Leone 249 years ago to her life on the plantation in the United States where she was taken, forced into slavery, and re-named Priscilla. Most amazing of all though, researchers have identified one of Priscilla's modern day descendants, great-great-great-great-great granddaughter, Thomalind Martin Polite, 31, who lives in South Carolina, not far from the plantation where her ancestor was a slave. Priscilla's extraordinary story is featured in a major exhibition currently showing at the New York Historical Society, Finding Priscilla's Children: The Roots and Branches of Slavery, which can be seen until 5 March, 2006. Earlier this year, Priscilla's descendant, Thomalind, a speech therapist, made an extraordinary "homecoming" journey to Sierra Leone at the invitation of that country's government. 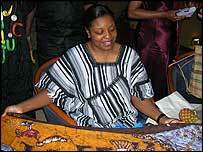 She met President Ahmad Tejan Kabbah and other top national leaders, and was given an African name in a moving seaside ceremony. Sierra Leone's most popular music group wrote a song in Ms Polite's honour: "Rush with the message, go tell it to the people, open the gates, Priscilla's coming home." I wish I could even begin to tell you where this recipe originated in our family. I simply don't know. I do know that both of my grandmother's had copies of recipes called Indian Corn Pudding. Grandma Dreher's was much like this one, except she used more sugar and "canned cream" [evaporated milk] in hers. This verion comes from a small piece of torn tabletpaper that my Grandma Bean had written the recipe on, and as written in pencil. I long ago lost the note paper [I'd give anything to have it today! ], but I have this recipe, and knowing it was the one Grandma Bean used, makes me feel pretty happy! Here's the recipe. It's an excellent dish, and your family will love it! Preheat oven to 450°. Lightly butter a casserole dish In a medium bowl whisk together & combine flour, salt, and sugar; mix in corn and melted butter. Beat eggs and add to milk. Stir into the corn mixture. Return to the oven for 10 more minutes. Repeat stirring procedure. Return to oven for 10 more minutes. Repeat stirring procedure. Return to oven for 10 - 15 minutes. Top should be lightly brown and pudding should be firm. While I'm not in the 1940 Census, both of my parents, all of my aunts and uncles, and all of my grandparents are in it. By 1940, only 2 of my great-grandparents are in it. And none of my gr-gr-grandparents. Are you in the 1940 Census? What ancestors from your family are in it? My Mother grew up on the tail-end of the Great Depression. She recalled how hard things were, and how they often did without when she was very small. When she became a teen, things began to get easier. And a few extras were finding their way into the home. ...a black velvet ribbon was woven through the beads, and tied behind the neck. When I turned 16, Mother presented these to me. 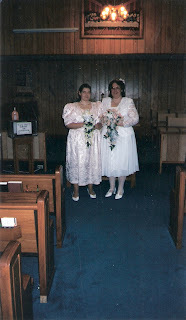 I wore them for Church and special occasions only. I once had them appraised by a jeweler. He issued me a warning to be cautious, as I was holding a small fortune in my hand... later, Grandmother told me that Grandpa had worked two full weeks for a man so that he could purchase the string of pearls for Mother's birthday. I love having these little pearls near me. I sometimes bring them out, and string a new ribbon on them, and wear them for some special occasion. I hope to pass them on to one of my granddaughters one day. Do you have a piece of jewelry that you hope to pass on to your children or grandchildren one day? While I fully understand the thinking behind making it difficult, if not impossible, to obtain full SS-5's from the Social Security Administration, in order to prevent identity fraud, I cannot understand eliminating the SSDI [Social Security Death Index]. The SSDI has already been changed to the point that social security numbers have been eliminated from the index when one is researching them online. And I can understand this, while I don't like it, I do understand it. However, part of the process in order to obtain an SS-5, was in providing the participant's social security number, thus making it almost impossible for an individual to obtain copies of this document. Isn't there a much more simpler way to prevent the identy fraud/ theft and still allow family members/ genealogy researchers to obtain necessary information? I believe the simplest solution of all is simply making sure the individual who requests a copy is identifying themselves. A full copy of their picture ID AND birth certificate, along with a genealogical tree that connects them to the participant should eliminate alot of questions. I know that most states require this for obtaining a birth record today. It would also help that when a number has been reported through death certificate that an individual is deceased, that when a request has been made, the number would be brought up as deceased when an individual attempts to use it illicitly. I mean, come on... when the US Government has stopped SS benefits because an elderly person is deceased...why do they then reopen the file allowing someone new to claim the number???? Children's numbers being used by adults??? Come on... when a social security number is assigned at birth, and the deceased child is four or five years of age, how can someone who is an adult have use of it! That should bring up a red flag within the SSA. I blame all of this nonsense on the SSA being mal-organized and its authority abused. A simple program written for red flagging birth years or dates that do not match could be added to the programming. When personnel don't find, let it be alerted through automaton. Come on ... when the US Government can flag the Library system's use, listen in to your telephone conversation from space, or red flag your personal blog, why can't they keep track of a simple Social Security number? Let's keep fighting for our FOIA rights. It is our right to know about our ancestors. Let's not allow ourselves to be denied access to information that should be ours. And that's where I stand. According to an article in US NEWS titled "U.S. Government Still Pays Two Civil War Pensions", by Lauren Fox, the following post is written. Although the Civil War ended on 09 April 1865, records from Department of Veteran's Affairs show that the children of two Civil War Veterans, as of September, are receiving pensions from their father's service. Affairs Spokesman Phil Budahn reports the Veteran's Administration last checked on these recipients in September 2011. At that time both were alive, but in poor health, giving one pause to believe the pensions won't last much longer. As to why these two began receiving these pensions, one can only speculate. Perhaps physical incapacity kept them from ever becoming employable, thus enabling them to receive the pension their life entirety. who died in 2003, at the age of 93. [Gertie was only 18 when she married 81 year old John Janeway. She became a widow at the age of 28. The two individuals who are the children of Civil War veterans, and still receive their pensions, have asked for annonymity. It is with awe that this country continues to pay pensions, on a war that ended almost 147 years ago!